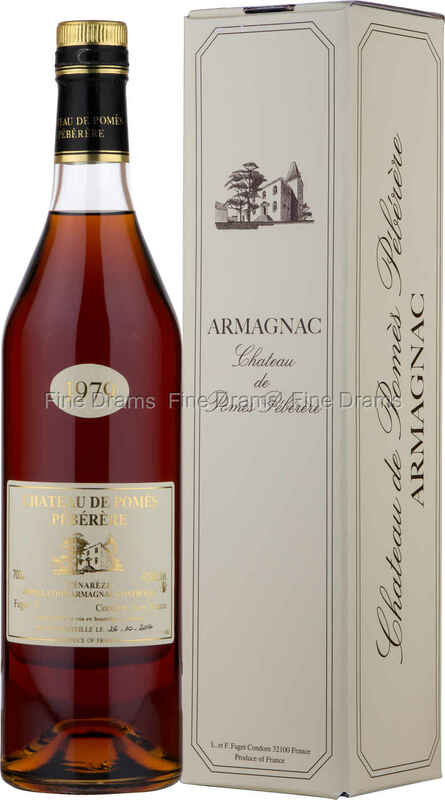 Another in this Domaine’s excellent series of vintage, long-aged Armagnac. Chateau de Pomes Peberere is a small scale distillery with just under 100 acres of vineyard. Here the Faget family have farmed the ancient farmland surrounding the ruins of the Gascon Castle since 1820. Their vineyard is planted on high sloping plateau, facing west, and therefore receiving plenty of sunlight. The soil is rich with limestone, clay and iron, perfect for producing an intensely flavoured grape. The distillery here grows their two main grapes, Ugni-Blanc and Colombard, which add finesse and strength respectively. Chateau de Pomes Peberere mature their spirit in large, 400 litre French oak casks in their wine cellars. The temperature of the cellars and size of the casks mean that this is a long, slow process which perfectly suits long aging, allowing the wood compounds to fully integrate with the fruity spirit. This is reflected by the spirit’s powerful flavours, with a delicious, leathery oakiness accompanying the inherent grapey fruity qualities of Armagnac. Typical to this chateau is the flavour of prunes, and that is demonstrated here, particularly on the finish – which is rich, chewy and replete with dried fruits.